Into the Wild: Fairy Tales Run Amok! Ever wonder what it would be like to throw all of the old fairy tales together and see what happens? 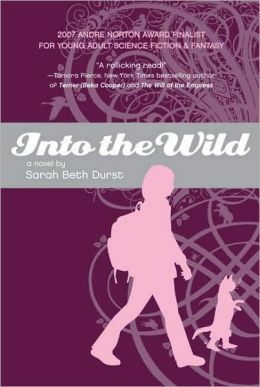 That’s pretty much the plot of Into the Wild by Sarah Beth Durnst. The “Wild” is a storybook forest that’s goal is to complete story upon story of fairy tales, recycling the characters such as Rapunzel and Cinderella through their stories over and over again with no end. Rapulzel or Zel, as she’s called in the story has beaten the Wild once before, forcing the forest into a little tumble of weeds that hides under her daughter’s bed. All of the fairy tale characters have moved into the real world and set up homes, businesses, etc, and are all too happy to be away from their respective stories. Julie, the daughter, has grown up knowing the characters apart from their tales and thinks of the Wild as a nuisance that eats her shoes and turns them into Seven League Boots. She knows her grandmother, not as the witch she once was in the Wild, but as someone caring and loving, who has a good relationship with Zel and would never want her back in the tower. Julie’s father is MIA, and no one seems to want to tell her what happened to him. The Wild, being, well, wild, gets out of control, taking over Julie’s town and imprisoning her mother and friends back in their stories and taking townsfolk with them. Anyone stuck in the growing forest could become a knock off Red Riding Hood or Sleeping Beauty. Julie finds she must navigate the strange rules of the Wild in order to save her mother, grandmother, the town, the world…you get the idea. I loved this book! It’s a quick read and is for younger readers, so romance is thankfully thin, and the adventure thick, magical, and leafy. References abound for those who know their Brothers Grimm, Hans Christian Anderson, and the like, and the stories generally stick to their original alarming endings. If you need a change from YA fairy tale romances, give this a try. I also attempted to read Winterspell, a YA romance loosely based on The Nutcracker and sadly, I could not finish it. Slinking seductively in the arms of a statue just…should not happen, I don’t care if the statue does turn out to be an enchanted prince. The sexual awakening and predator scenes dragged the beginning of the book, and having the prince run around naked for an extended time after that just became creepy. Guys aren’t just pieces of meat either, you know! A lesson I dearly hope Clara learns throughout the story, though I did not want to take the time to find out. I like to think of YA fantasy-romances as something apart from the “Romance” genre, but maybe I’m kidding myself. At any rate, kudos to the author for trying to tell The Nutcracker in a new way. Sadly, it just wasn’t for me.